Everything Mythology by Blake Hoena. Review: From the Cyclops to Poseidon, learn about all the beasts, gods, and goddesses of the ancient world. Surprises abound in this book, Everything Mythology, by Blake Hoena. Everything Mythology includes many stories such as the battle of Ragnarok, in which the Norse gods fight their final battle. Learn about Arachne and how exactly she got turned into a spider. You'll also be able to find out where old temples for the gods were located as well as what people used for sacrifice. In Greek myths, you'll learn about the ups and down inside this big family including beasts and tricksters such as Prometheus, who stole fire from the gods to give to the suffering humans down on earth. There are also a lot more mythological creatures, such as Satyrs and Garuda, a god and a bird! Some, like the Pegasus, even fly! There is so much more to learn in Everything Mythology, but I won't give it away! I love this book because it tells about some of the biggest gods and goddesses from around the world, and even some you may not even know! My favorite is Garuda, the bird-like god. Also, I think that some people would like to read myths from foreign countries, such as the Anansi the spider, who tricks the sun god Nyame, into giving rain to the people down earth, which we can all be grateful for, especially in the summer! I recommend this book to 7-12 year olds and to anybody interested in mythology. I hope you enjoy! 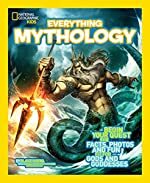 We would like to thank National Geographic for providing a copy of Everything Mythology for this review. Have you read Everything Mythology? How would you rate it?